Near Field Communication or NFC for short is a type of wireless communication that happens between devices that are NFC-enabled such as smartphones, tablets, smart watches, etc. 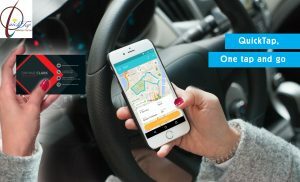 The NFC user can tap their smartphones or devices on an NFC tag – this allows information to be passed along without having to download an app or having to touch the device directly. This is how the technology works. A device (known as a reader, or an active device) creates a radio frequency current that transfers information to another NFC compatible device or an NFC tag containing this information. So in simple terms how does QuickTap Smart Marketing work? QuickTap makes shopping more convenient. You know how sometimes you walk into a store and you see something you like but you’re not sure if you should buy it so you start to do the angle on the shoulder thing and eventually pick up your phone, go to the internet, type in the product name, search through all of the reviews just to make a buying decision? What a hassle! Well now thanks to QuickTap all you have to do is tap your phone on a product and viola, you get access to all of the information you need. Am talking reviews, product features, YouTube videos and so on and so on. We make it so easy, like a one-stop-shop. Packing all of that information into one super information so you don’t have to get dizzy trying to figure it all out! For Business Cards – Do you want your business cards to speak for you? You own a business. Yo u carry around all those business cards to draw potential customers to your business. Well not to disappoint you but most people end up losing your business card or get lost trying to find your place of business. Do you know that 10 billion business cards are printed every year and 88% of these cards are discarded? This is where QuickTap comes in. 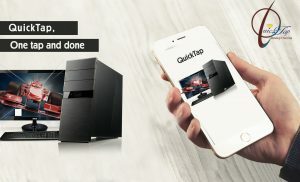 QuickTap creates business cards for you and installs a coded NFC chip in the card. These cards are live marketing tools designed to provide relevant information, GPS location, website, goods and services offerings and customized business information of your choosing. Even though you are not there, your business lives on! Near Field Communication or NFC for short is a type of wireless communication that happens between devices that are NFC enabled such as smartphones, tablets, smart watches, etc. The NFC user can tap their smartphones or devices on NFC-compatible devices which allow for information to be passed along without having to download an app or having to touch the device directly. This positioning as one would expect focuses primarily on how people are searching for things on their smartphones and how brands can leverage Google inquiry to convey helpful, convenient, applica ble, logical data to individuals when they’re in these “micro-moments” which is a perfectly made stage for Google to communicate their core value proposition with brands and the broader marketing community. With that said, I also believe “micro-moments” is an immaculate account for the NFC business when looking at services that deliver value to brands and their clienteles which oddly can disrupt search in different ways, particularly in-store where consumers are searching more using Google and other search applications to get product information. (82% of us consult our phones in-store deciding which product to buy). Take a second to consider this. Why are you looking in-store? Why are you thoroughly searching for everything? The main reason is you have shown to Google (not the brand) that you need enough data to settle on some kind of choice inside the store. That is the reason for most searches that happen in-store and on the off chance that I was a brand or retailer I’d take this information as an enormous reminder that your in-store experience is not engaging enough for consumers… … a considerable measure. Consider the amount of posters and other information materials that are packed into retail space! From posters to display banners, to staff and we’re all searching like never before. This is where QuickTap as a company can help brands create an immense gigantic worth to the customer experience and ultimately the brand itself. 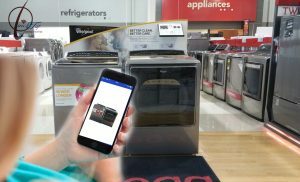 QuickTap has created NFC advertising so that retailers and other businesses can quickly connect customers who are searching for relevant product features and benefits. In order words, QuickTap is helping businesses become more connected to their customers and to become an intelligent consultant to shoppers. 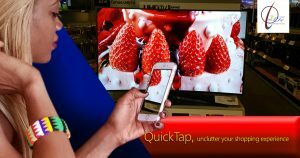 Quicktap offers shoppers the ability to quickly tap their smartphone on several Point of sale (strategic locations) to allow consumers comprehend the features and benefits of the product they were looking for. QuickTap compiles relevant information such as product reviews, manufacturers videos, tips and tricks of the product etc.— all in one place for a hassle-free shopping experience. Sounds amazing, right? Imagine an innovative product that can make it simple for customers to get in-store information on their cell phone, with content that will increase the value of their shopping experience (i.e. not spamming customers with promotions from competitors) and you have an exceptionally customized involvement with the brand you offer in your stores. QuickTap can help you use this information to gather rich data analytics around each in-store collaboration, rather than making the customers do all the work physically through looking — giving Google all the consumer information/data and missing a brilliant chance to get nearer to the consumers at the last 3 feet of the consumer experience. A great deal of these ” Micro Moments” is utilized by Google. This ought to be taken as a test to brands on how businesses can use NFC innovation to enhance the buyer experience inside a physical store so consumers don’t need to search, they can just Quicklytap on Quicktap enhanced surface for information – no thumb writing, no application downloading — making handshakes occur in minutes with brands, thereby bringing about more profound and immersive connections with your customers.